Yesterday I was invited to Barbeque Nation. They have recently launched Dilliwali Khau Gali. 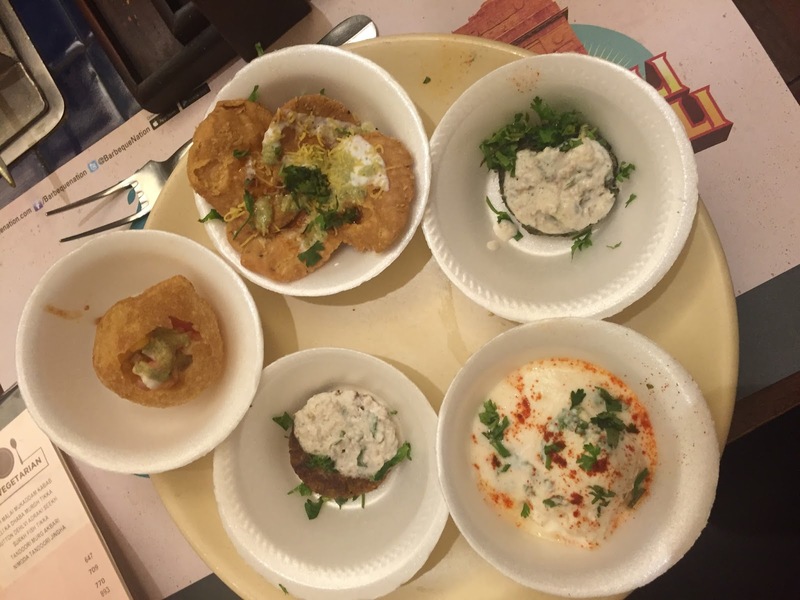 You may wonder what "Delhiwali Khau Gali’ all about? Well, ‘Dilliwali Khau Gali’ is the enchanting food of Delhi street. It is Delhi Street Food Festival with toothsome Haryani, Punjabi and Mughalai delicacies food being served. Not only in food, feel and ambience, they are celebrating Dilli’s culture in its real essence. Specially food of Chandni Chowk, Delhi Haat and Janpath. They have put in lot of hard work to prepare this festival. They faced a lot of problems to set it up. But I could see the result in the form of satisfied guests. The festival is from to 22nd July 2016 till 7th August 2016 in Dinner ONLY and on Sundays for both lunch and dinner. 1. Tandoori malai khumb (Mushroom) - Stuffed mushroom cooked in cream base marination and dominating flavour of cardamom. 2. Dhelvi paneer teh pe the (Paneer) - Spicy and tangy flavour stuffed paneer cooking in tandoor. 3. Nadru kebab - Spicy combination of spices, lotus stem and potato. Veg Live Counter - Chawdi bazar ke choley kulche, Parathe wali gali (tandoori masala tawa parantha), Papdi chat/Gol gaap chat and Dahi bhale. 1. Surkh fish tikka (Fish) - Brightened coloured preparation of fish seasoned with bhatti masala. 2. Dilli ka dhaba murgh tikka (CHICKEN SPECIALITY) - Chicken cube bbq style seasoned with dhaba style preparation. 3. Mutton dehlvi adraki seekh (Mutton) - Popular street seekh kebab of delhi served with lachha onion and mint chutney. 1. Dehlvi shahi chaap - Single bone strip mutton chap seasoned with indian spices and served at live like Delhi street. 2. Daryaganj ka gola kebab - mutton ball season with spices tossed and served hot from live counter. 3. Fathepuri ka fry chicken - Very popular tawa chicken of Jama masjid served in bbq nation style live counter and season with desi chat spices. 4. Gosht ki galawat with ulte tawe ka paratha - Mutton fine paste season with spices and dunkar and served along with bite size ulte tawe ke paranthe. Veg : Makhmali paneer, Subz nizami ka mela, Dunkaar anjeer kofta curry, Matiya mahel ki hariyali subzi, Dehlvi aloo katliya, Dal teen patta tadka, Kache paneer ka biryani, Chandni chowk ki subz briyani. Desserts: Garama Garam Jalebi, Blue berry cheese cake, Chocolate Galaxy, Dark cheese brownie, Gulab Jamun and Green Grapes (Fruit). In last you can experience the Kulfi with other varieties and topping to. They have decorated the restaurant in 3 Zones, Janpath, Delhi Haat and Chandni Chowk. Their décor, feel and look assures that the guest immerse himself in the ambience. They are celebrating the Punjabi mood with dance and music as well. There are no extra charges for this. Their menu selected in Bangalore for full region. 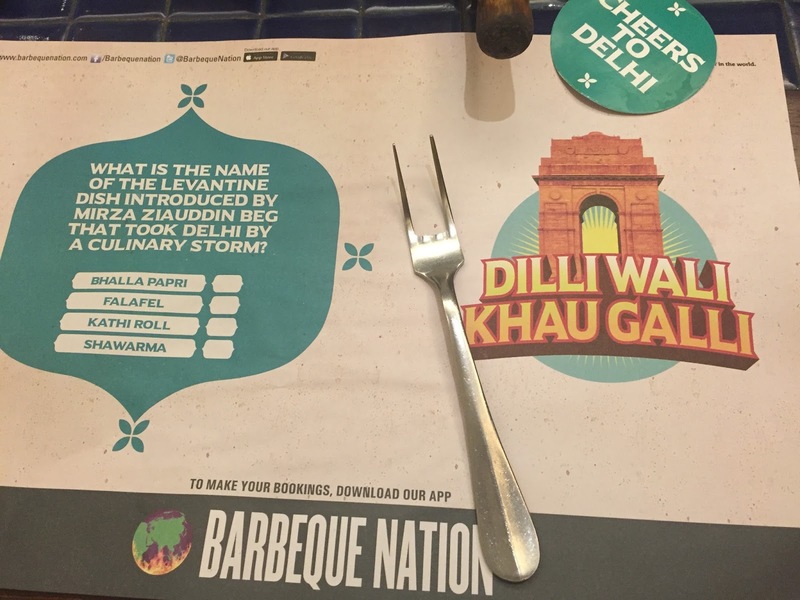 The concept of Barbeque Nation is that they serve the grill. The snacks are 90% cooked (grilled) and 10 % uncooked. You barbeque them live on your table. You apply the sauces with the brush and prepare them according to your taste and choice, on a live fire. When you finish the snacks you put flag down. There are 4 non vegetarian snacks and 4 vegetarian snacks. There is a live counter with buffet also. You can tell the chef to prepare according to your taste. How cool is that. There are salads, soups, main course, biryani, 10 items of deserts, 6 varieties of kulfis. The main course is self service. When I entered the restaurant in Connaught Place, it was buzzing. I could see a lot of families (happy families) enjoying a relaxed dinner. It seemed some kind of festivity or celebration. It was crowded and noisy. I was taken and seated to a quieter and a nicer area. I was thrilled with their hospitality and their eye for details. They really took care of each and every customer's needs. I was told that the place is frequented by families, corporates, office goers and even expats. The concept is all you can eat. I noticed very courteous staff who looked after small details and were extremely prompt. We were very well looked after. By definition all barbeque is fun and gives you good time. It certainly is a novel and new concept that for Indian palette they are providing barbeque. Barbeque is very Argentine or is popular in US where family meetings are held around barbeque. But in India, it is being introduced to Indians. There are not many barbeque restaurants in India. They serve both vegetarian and non vegetarian. I would be delighted to bring my Argentine friends here. They say in Argentina, that the man, who does not know how to prepare charcoal and meat on top, might not be a true Argentine. In Spanish, barbeque is called Asado. Similarly in Brazilian restaurants, there are barbeques but with lot of meats of different animals. Here it was more according to India palette. Barbeque Nation is something different. The fact that we get good barbeque, chance to taste chicken, pork, mutton, prawn, fish, vegetarian in such unique manner in a family restaurant and for its concept, this restaurant scores points. We give 5 for that. But having said that, for Indian food, it is standard. It is complicated to get barbeque on the table. Generally, you go outside to prepare it. But in the restaurant, they have facilitated it. There were no fumes. Our clothes did not end up with smell of barbeque, It is good that they get 90% cooked and only 10% cooked on table. The place with barbeque has to be very well ventilated. We did not feel any fumes. Kids also seemed curious about barbeque and were seeming to try it. Adjacent to our table was a family who really seemed to be enjoying their dinner. I asked them their opinion of the place. They told me that they were visiting the place for the 10th time. They liked the freshness of food and said that the best outlet was Connaught Place. The girl also mentioned that it was her father’s favourite place because of value of money. I really wanted to share the picture of her father. It was an amazing family and it was endearing to see this gentleman (the father). He seemed relaxed, chilled, enjoying the meal and hearty conversation. He was giving fantastic suggestions. He told them that there should be kites added as part of decorations. Specially for 15th August. He even dozed off for a bit. I could not help but admire him. Does he not look so calm and graceful? Live Barbeque on the table. You put the flag down to indicate that your starters are finished. Kajun spice potato. Barbeque signature dish. It was perfect barbeque. The dishes were done well and were delicious. Problem is that once you take it out of grill, it gets cold but that is how it should be had- right from the grill. They serve non vegetarian and vegetarian together, in the same barbeque, though at a little distance. I started with Spiced Tango. Rs.95/- . The word "tango" did catch my eye. It was Aamras combined with fresh ginger juice, lime juice, black salt and Tabasco in this back to roots delight. It was super nice and refreshing. It did not disappoint its name. We also had Tamarita Rs.200 – Indian twist to the margarita with tamarind making it tangilicious. I must say here that their cocktails are not fantastic. Skip them. Stick to the drinks they offer as part of the menu- chaas etc. There was punjabi music which made the place super lively. There was a live performance by the staff. It seemed happy staff and happy customers who were whistling and cheering. They were treating all customers with great care and attention and preparing things according to each one's tastes. I was served Dhelvi paneer teh pe teh. It was unlike paneer tikka. It was not so spicy. In fact, perfect for my taste. It was not overcooked or overladen with spices like normal paneer tikkas. The tamarind sauce seemed to be the best. Combination of all vegetarian and non vegetarian was perfect. There were mushrooms, pineapples, etc. Check the video of live performance by the staff and live food counters and buffet. Chaat platter seemed little spicy but just the way chaats should be. I cannot handle too much spices, but it was a good selection of chaats. They were delicious. I loved shahi tukda. It brought me some childhood memories. Another noteworthy thing about the restaurant is that they strictly do not accept the tips. Is it not commendable? Me speaking to Jayveer Lal- CC Chef. This is a perfect weather, perfect season, to bond with your loved ones. While their festival is on, I highly recommend you to try this restaurant. Go today with whole family. Bring some celebration in your life.